ALICE DUNBAR-NELSON READS is a project of digital scholarship devoted to recovering the bibliophilic history of Alice Ruth Moore Dunbar-Nelson (1875-1935). It serves to document inherent connections that existed between authorship, readership, and friendship in the private and social literacy practices of an early 20th century woman of color. Up until recently, the bulk of the research into the biography and literary contributions of Alice Dunbar-Nelson has centered on her status as the former wife of poet Paul Laurence Dunbar and her work as a writer and Delaware-based activist. Relatively little attention, however, has been paid to her lifelong love affair with literature and the printed word, not as a writer but as a reader. This project aims to address this gap in Dunbar-Nelson scholarship. Drawing from the Alice Dunbar-Nelson Papers (MSS 113), held at the University of Delaware Library, Museums, and Press’s Department of Special Collections, the project introduces transcriptions for a series of Dunbar-Nelson’s reading journals that document twenty years of her reading habits. Along with these transcriptions, the project includes a handlist of extant books from her library collection with its noted interventions, visualizations of data mined from the digital transcriptions, and other relevant supplementary materials from the collection. 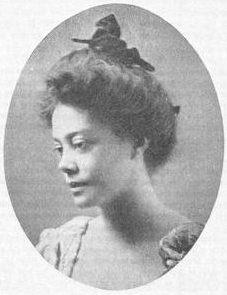 Building upon a growing amount of existing scholarship devoted to post-Reconstruction African American literacy practices and strategies for racial uplift, the intentionality of this project stands as a counterpoint to clichéd narratives that cast women of color from this period as largely uneducated and illiterate laborers. Concomitant with the implicit confrontation with this myopic view of turn of the century women of color, this project offers a complicated and nuanced picture of African American readership as it relates to racial and gender identities. Lastly, it contributes to the problematizing of strict racial dichotomies in readership studies by revealing a multifaceted process of intellectual creolization not limited to Dunbar-Nelson but certainly emblematic of her scholarly cultivation. Jesse Ryan Erickson, Ph.D. is a researcher in the study of print culture, the history of the book, and special collections librarianship. His specializations are in ethnobibliography, African American print culture, and transnational Ouidiana. This project would not have been possible without the input, guidance, and support from Dr. Curtis Small, Mark Samuels Lasner, L. Rebecca Johnson Melvin, and Timothy Murray at the University of Delaware Library, Museums, and Press’s Department of Special Collections, Natalia Lopez and Carol Rudisell at the University of Delaware Library, Museums, and Press, Prof. Ellen Gruber Garvey at New Jersey University, Anne Boylan, Professor Emerita of History at the University of Delaware, Dr. David Kim, Dr. P. Gabrielle Foreman, Ned B. Allen Professor of English at the University of Delaware, and Denise Burgher, Mali Collins-White, Frank Desiderio, Brandi Locke, and Kelsie Shipley.